Donald Rumsfeld is a retired American political figure and businessman. 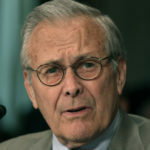 Rumsfeld served as Secretary of Defense from 1975 to 1977 under Gerald Ford, and again from 2001 to 2006 under George W. Bush. He is both the youngest and the second-oldest person to have served as Secretary of Defense. Additionally, Rumsfeld was a three-term U.S. Congressman from Illinois (1963–1969), Director of the Office of Economic Opportunity (1969–1970), Counsellor to the President (1969–1973), the United States Permanent Representative to NATO (1973–1974), and White House Chief of Staff (1974–1975). "First rule of politics: you can’t win unless you’re on the ballot. Second rule: If you run, you may lose. And, if you tie, you do not win." "You will launch many projects, but have time to finish only a few. So think, plan, develop, launch and tap good people to be responsible. Give them authority and hold them accountable. Trying to do too much yourself creates a bottleneck." "Politics is human beings; it’s addition rather than subtraction." "Presidential leadership needn’t always cost money. Look for low- and no-cost options. They can be surprisingly effective."